Dentistry has always been a passion for Dr. Hanamova, and she is happy to have the opportunity to help her patients improve their oral health and have better quality of life. She spends a significant part of her life on continuing education to ensure that she delivers the best dental care to her patients. She works hard to build long-term relationships with her patients based on trust and mutual respect. Her most rewarding moments are seeing happy patients and knowing that she helped to bring their smile and confidence back. 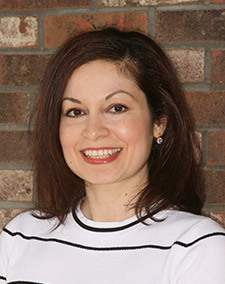 Dr. Hanamova was a successful dentist working in a private practice in Moscow, Russia, when she immigrated to the US with her family, her husband and two boys. She loves the profession of dentistry and helping people to achieve their dental health, so after moving here, she decided to pursue her dental education and obtain a dental license in the US. Dr. Hanamova was very fortunate to have been accepted to UCSF School of Dentistry and have the wonderful opportunity to study at one of the best universities in the world. Dr. Hanamova feels fortunate to be a part of the highly knowledgeable and skilled team at Live & Smile Dental & Orthodontics. She and the rest of our team share the same treatment philosophy—to deliver the best dental care to our patients with a high level of ethics and standards. When Dr. Hanamova is not working, she likes spending time with her family. They enjoy traveling together, exploring new places, and watching moves. Her hobbies include gardening, reading, cooking, baking, and swimming.